Pioneer previews UDP-LX500 4K Blu-ray player | What Hi-Fi? UPDATE: After teasing a new machine back in April, Pioneer has finally previewed its new Ultra HD Blu-ray player. 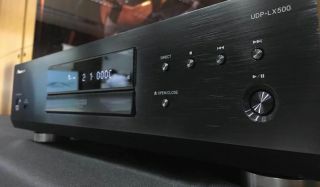 It was spotted at a Japanese AV show over the weekend, and while specs, pricing and availability are still to be confirmed, we now know it's called the UDP-LX500. An image (below) of what looks to be two soon-to-be-unveiled boxes covered by cloth has been posted on Pioneer’s Japanese website. And as the page, spotted by Inside CI, has ‘BDLX’ in the URL, we’d put good money on them being Blu-ray players. That's based on the model numbers of its most recent players, 2014's BDP-LX58 and BDP-LX88. What's more, it seems likely the mystery players would be of the 4K flavour - especially when you consider that the Japanese text on the teaser image reads ‘gyouten’ (which translates to ‘dawn’), with the bottom line translating to ‘finally’. That certainly suggests a new chapter for its players, and the kind we’ve been waiting for. After all, the likes of Panasonic, Sony, Cambridge, Samsung and LG have been occupying the market for some time. But it would be a good time to enter the market now development of Oppo’s triumphant high-end players will soon cease following the company’s recent decision to ditch its hi-fi and Blu-ray player business - particularly as the Pioneer players would likely follow its LX siblings into the pricier end of the market. Would a forthcoming Pioneer player rival its contenders with Dolby Vision support too? The HDR format is currently supported alongside HDR10 on a lot of high-end contenders. And what about HDR10+? We await an official announcement, and some concrete details, with great anticipation.